This building visit led by Alan Dempsey of Nex—, will start at the Danish Embassy designed by Arne Jacobsen and move to the Duke of York Restaurant designed by Nex—. The conversation will be co-led by an AA PhD candidate. 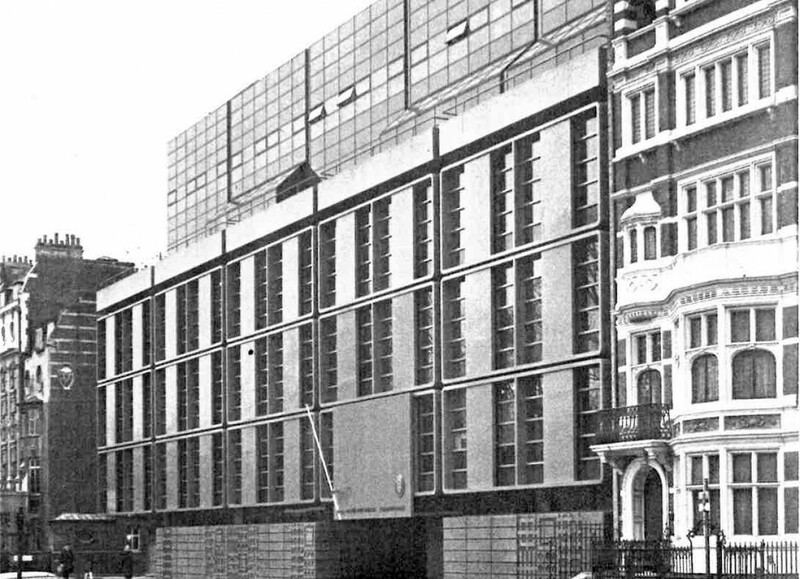 The Danish Embassy in London was designed by the Danish architect Arne Jacobsen. It is a purpose-built embassy in modernist design, which houses the chancellery functions as well as the ambassador’s residence. The design was made in respect to the scale and the traditional composition of buildings in the area, while at the same time creating a functional entity. The visible structure of the embassy comprises of stacks of glazed boxes, cantilevered out from concrete walls. Designed by Nex—, The new Duke of York Restaurant occupies a prominent position on the King’s Road. The form of the building responds sensitively to the adjacent Grade II listed screen wall of the Duke of York Headquarters. A counterpoint spiral of ribbon like off-white concrete leads to a public roof garden, supported on glazed arches. At ground level, the interior is designed with a desire to create a restaurant for all seasons, which connects interior and exterior. A technical world first — the innovative curved glazing can lower into the basement, allowing alfresco dining in fine weather. Alan is the founding Director of Nex—, Alan leads the design of all projects at Nex— , a London based architecture studio that designs buildings and spaces defined by place, people and atmosphere. Alan graduated from the AADRL in 2002 and taught undergraduate and post-graduate courses at the AA from 2005-2013. Alan’s work has been recognised with awards and commendations from the D&AD, The Architects Journal, UK Technology Strategy Board, World Architecture Network, Building Design, and the Architecture Foundation. He has been an invited speaker at the AA, NAI, CAFA Beijing, ETH, MIT and other international venues. Posted on May 28, 2019 April 2, 2019 by membership	Bookmark the permalink.